From as early as 1910 the Jowett Company had manufactured cars and light commercial vehicles that featured horizontally opposed twin cylinder engines. They were of 6 – 8 horsepower, with the 8 horsepower version surviving until the cessation of manufacture in 1953. Its final use was in the Bradford range of light commercial vehicles. In the years prior to the Second World War the company decided to add a horizontally opposed four-cylinder engine to their range. After much experimentation a horizontally opposed side valve engine was introduced in the Jason saloon at the 1936 London motor show. Later, a twin carburettor Jupiter model was introduced. This engine remained in production until the commencement of WW II. After the war the flat four engine type was further exploited by Jowett Cars Limited when the Javelin saloon was introduced in late 1947. Both the car and its engine were completely new. This exciting new car was the result of new manufacturing techniques and procedures that had not been used previously by the Company. Indeed, some of the new production techniques were pioneered by Jowett Cars Limited. The engine used in the Javelin featured a die-cast aluminium crankcase that was joined along its centreline and featured wet cast iron cylinder liners. It was the first mass produced motorcar to feature a die-cast aluminium crankcase (cylinder block). The centreline joint was a new production technique for the factory. All previous engines manufactured by Jowett had one-piece aluminium crankcases that used separate cylinder barrels attached to each side. Indeed, this type was first considered for the Javelin it its initial design stage. However, with the need for higher engine performance that could be ably produced by the proposed overhead valve configuration, there was a need for a well supported three main bearing crankshaft. It was soon determined that a split, well reinforced crankcase would be the most satisfactory route to take. A single piece aluminium crankcase was tried, but it was found to transmit an excessive amount of engine noise and the centre main bearing was difficult to hold rigid. Thus, after considerable development work and testing of different types and metals, for the crankcase, it was decided to use the die-cast, centre joint line, aluminium crankcase in production. Improvements made to the original design will be discussed later. The crankcase used in the Javelin and Jupiter motorcars is, if cared for properly, an extremely durable unit. The concerns that can be attributed to the crankcase's design are mostly generated by the failure of other components, or by misunderstanding of the Jowett engine's assembly requirements. The primary aspect of crankcase identification is to establish whether the crankcase assembly is a matched set. There is a set number stamped into the upper face of the front of each half. These numbers, which can differ from the engine number, are unique to the crankcase set. They are not as prominently stamped as the engine's Serial Number is stamped into its plinth. It is vitally important that the set numbers match. The Engine Number can assist in identifying the type of crankcase set being examined. Engine Numbers with the letters PA, PB, PC, PD and SA within them indicate that the crankcase is of the earlier type. Those engine Numbers containing PE and SC can be considered to be of the later type. However, some PD Javelins and SA Jupiters were equipped with the later style sets. In addition to the above, there were sets of crankcases of the earlier type that had enlarged oil galleries and machined oil grooves in the main bearing supports. E1 PC 16744 Oil groove added to main bearing bore. E2 PD 21937 Crankcase oil flow increased. E2 PD 22190 Redesigned crankcase introduced. E2 PD 22221 Series III engine introduced. E2 SA 882 Series III engine introduced. Set No. 26574 Synthetic rubber liner seal fitted. Set No. 26496 Oil gallery plugs improved. 1. The very early crankcase similar in detail to the drawings in the various parts lists. It is a definitely heavier casting and the most noticeable difference is a flange formed above the sump rim. 2. The most common die cast crankcase. 3. The Series III crankcase which has radial webs around the main bearing supports and is stamped '3' on the shoulder above the petrol pump mounting, and 'PE' above the engine number. There are other differences too, which arise in all forms of crankcase since many reconditioned engines had crankcases modified to bring them as close to the Series III type as possible. These modifications included machining an oil way in the main bearing seatings and opening up the oil drilling from the oil delivery pipe to the later Tecalemit type rear timing cover. Moreover, some Phase I and Phase II engines had their crankcases replaced by new crankcase sets of Series III type, but without any outward marks of '3' or 'PE', but simply the copy of the previous engine numbers. The crankcase halves were always made in pairs, particularly as far as machining of the main bearing and camshaft bores were concerned. Curiously enough the drilling of the main bearing supports was not absolutely identical in all crankcases, and in fact, the centre line of the crankshaft can move from side to side and up and down with reference to the crankcase. Naturally, this means that the likelihood of two random crankcase halves matching is remote and they will probably differ to a degree, which makes it impossible to put them together. The error in machining the main bearing supports slightly to the left or right of centre is decidedly worrying when it is encountered, since it is obvious that one bearing shell protrudes above the face of the crankcase in which it is located and, of course, the matching half looks to be too small for the housing. A more obscure difficulty is related to this problem of one-off boring of crankcases. Whilst it is often assumed that any flywheel/clutch housing will fit any crankcase, this is not exactly so. The bore in the rear of the housing which takes the gearbox clutch shaft cover is also machined to match the crankcase – at least it should be according to the original Jowett Cars Limited manufacture. That is to say it was centred on the main bearing bores in the crankcase with which the flywheel/clutch housing should have been used. Thus it is just possible that the wrong housing would put the clutch friction disc far enough out of centre and alignment to cause trouble with excessive wear, judder etc. It is fortunate that this cause of trouble at the clutch has not been traced, but it is certainly a possibility. Another difference less commonly observed in crankcases is that of the oil feed holes to the tappets. On the original hydraulic tappet crankcases the oil galleries were drilled so that the diameter broke through into the tappet bores and thus there would be large oil supply holes, which varied quite an amount in size. Usually they were between ¼" and ⅜" in diameter. When solid tappets were introduced these large oil feed holes became an obvious source of oil pressure loss and of course, the solid tappets required only a relatively small feed of oil for lubrication. Therefore on Series III crankcases and on some later crankcases of the earlier type, the oil galleries were drilled above the tappet bores and do not intersect them. The oil feed is about 1/16" diameter drilled obliquely into the gallery, drilling from the inside of the crankcase through the mouth of the tappet bore. This means that the oil feed hole is insufficiently large to operate hydraulic tappets properly and in any case is not correctly situated. It also means that low oil pressure at low idle with solid tappets on an otherwise good engine can be related to the oil loss from hydraulic type oil feed holes in the tappet bore. A further complication worthy of mention is that some Series III crankcases were certainly made for hydraulic tappets, and the only way to find out is to remove a tappet and feel for the drilling with your little finger. Before using a crankcase for engine overhauling purposes, it should be carefully inspected. The crankcase set should be thoroughly cleaned prior to examination. It is wise to check first for cracks which may have been caused by frost, water leakage into a cylinder or simply, the inappropriate method of engine assembly. 1. Along the underside of each half near to sump stud rim (about one inch out). Cause – Frost damage can cause these cracks. 2. Inside the push rod chamber over number four cylinder. Cause – The cause of cracks in this area can be caused by too much cylinder liner protrusion, incorrect use of the cylinder head studs (threading in upside down) or frost damage. 3. Under the water inlets running downward at the rear faces. Cracks here can also run outwards to the cylinder head gasket surface. Cause – Too much cylinder liner protrusion and/or neglecting to install the water inlet elbows prior to tightening cylinder head nuts. Also can be caused by frost. 4. Along the front edges of the front faces between the water transfers and timing housing. 5. Vertically from the sump face between the petrol pump flange and the front of number two cylinder (sharp right-angle due to machining the petrol pump flange surface). 6. Internally round the top four stud housings for the cylinder head studs on each half. Cause – Cracks here can be the result of too much cylinder liner protrusion. 9. Very severe cracking inside the push rod chests. Cause – When a cylinder head gasket leaks and one cylinder partly fills with coolant, engine starts instantly and the coolant is in a cylinder under compression after initial engine start-up. 10. Cracking can be found running through the centre camshaft bearing bore and continuing to the top joint flange. Cause – Is usually due to the upper centre tie bolt being forgotten in the dismantling process and the use of levers in the attempt to separate the two crankcase halves. 11. A crack inside the tappet chest can be caused by the engine starting with one cylinder full of water, due to cylinder head gasket leakage. Usually cylinder blocks and crankcases are recommended to be inspected for cracks caused by frozen cooling water trapped in the water jackets. Obviously, such frost damage is not generally a concern in Australia. In those instances where cracking has occurred due to excessive cylinder liner protrusion, a cause can be also attributed to uneven tightening down of the cylinder head. This should be carried out in three equal stages. Provided the crankcase is thoroughly cleaned and properly prepared for welding, the aluminium welds easily. Care has to be taken with respect to distortion. Modern welding techniques reduce the risk of distortion. Good welding practices can be used to build-up the wall thickness of the coolant jackets where corrosion has taken its toll. 1. Stripped threads at the rear timing cover securing bolts. Frequently these have been tapped out to 3/8" BSW or UNC thread forms. Such repairs are an indication that the securing setscrews were over tightened in attempts to stop oil leakage due to a failed gasket. This practice is not a good solution to the problem because the larger diameter thread will be very close to the oil gallery drilling. 2. Stripped threads at the oil pump mounting studs. 3. Stripped threads at the petrol pump mounting bolts. 4. Stripped sump stud threads. 5. Cylinder head stud threads are in sound condition and that there are no cracks in surface that is close to cylinder liner flange. Some crankcases are very thin in this area. Such cracks have been successfully welded with the stud in situ. 6. Wear at camshaft bearing bores. The centre camshaft bearing bore could be worn more than the other two. 7. Distortion at the main bearing supports. When checking this area, look for distortion that may have occurred because of crankshaft breakage at high engine speeds. Another cause of distortion can be over tightening of the six crankcase tie bolts. Yet another cause could be due to sloppy assembly procedures allowing foreign matter to remain on the crankcase joint faces. 8. The main bearing bores, and the clutch housing seal bore, should be measured for truth and the provision of correct shell bearing crush. Loose bearing shells will cause crankshaft rumble and oil pressure loss. 9. All gasket and joint surfaces are free of burrs and distortion around threaded in studs. 10. Break-through of the five upper flange bolt holes into oil wet area. This is not a serious concern, but care needs to be taken during engine assembly, to ensure prevention of oil leaks. 11. Spot facings for tie bolt flat washers are smooth and flat. At some tie bolts there is engine oil pressure in tie bolt bores. 12. Fretting damage to front engine mounting bracket support bosses. This is caused by prolonged use with loose securing nuts. 13. 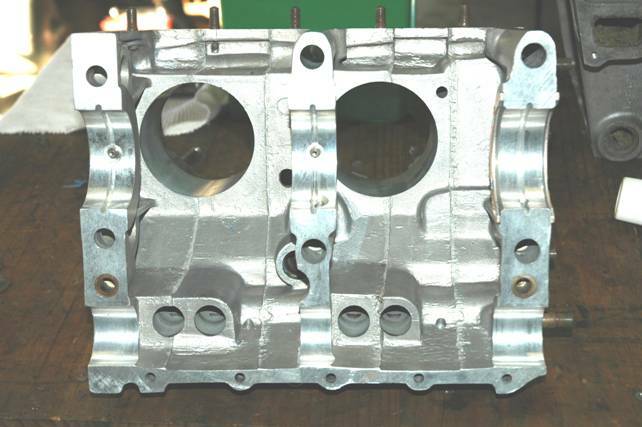 Check the general appearance of the outer surfaces of the crankcase. An engine that has been overhauled should be of good presentation. 1. Machining grooves in the main bearing supports so that lubricating oil can be delivered from two points instead of one. 2. Conversion of rear main bearing support so that separate thrust bearings can be installed. Due to scarcity of the original flanged bearing in the under sizes, this is a very worthwhile modification. If this modification is installed, a benefit is the use of the same bearing material for all three main bearings. 3. Enlargement of the oil feed gallery to the oil filter – this should be done in conjunction with increasing the oil feed pipe and oil filter housing drilling diameters. 4. In the LHS half, relocation of the oil drilling from the oil filter to the longitudinal oil gallery. This can be achieved by machining a larger diameter counter bore, installing a suitable plug and re-drilling the oil drilling further (2 mm) away from the rear timing cover securing bolt thread. 5. Extending the rear cylinder head stud through the water inlet bore. This requires the use of a long series 3/8" BSF tap. Jowett Engineering modified crankcases for their reconditioned engines in this manner. 6. Installing those studs that break through into oil wet areas with good quality gasket sealant. With assistance from The Jowett Car Club (UK). With Thanks – January, 2006.